From their beginning in 1953, as a small structural steel warehouse with four employees, Adrian Steel Company has grown to become a leader in the van and truck equipment industry. Located in Adrian, Michigan, our manufacturing facility now encompasses 166,900 square feet with over 300 employees. Adrian Steel is committed to providing quality products highlighted by constant innovation. Adrian Steel’s attention to detail and customers is thorough, it began through the corporate values instilled by founder Bob Westfall, University of Michigan All-American and Detroit Lion All-Pro football standout. Those values instilled a team effort to provide customers with value-added products and services that have become the standard of our industry. 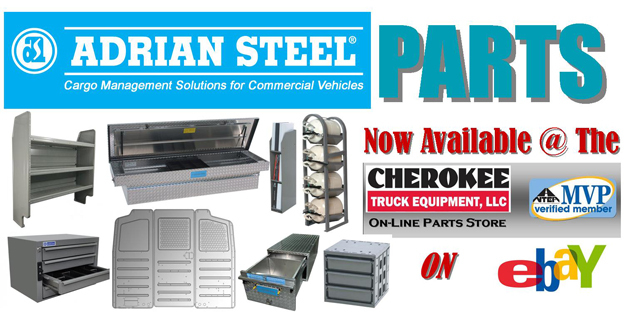 The following Images are of a An Adrian Steel Package that Cherokee Truck Equipment Recently Installed.